Part Number 15398. 2001-2004 6.6L LB7 Duramax Turbo Diesel. The MagnaFlow Duramax downpipe is built from 3" mandrel bent stainless steel & features a durable high. Magnaflow Downpipe 3" Stainless Steel. Text or Call me anytime 817-228-1215 !!!!!!!!!!! 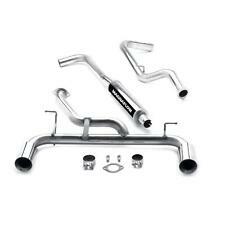 Magnaflow 15726 100% all stainless steel construction. Magnaflow 15726. Fits 2.0 Liter I4 engines only. Stainless Cat-Back System. 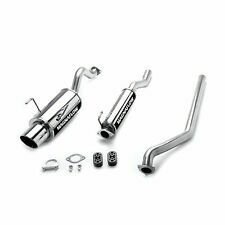 Magnaflow 15786 all stainless steel construction. Magnaflow 15786. Stainless Cat-Back System. Fits 2.4 Liter Turbo I4 engines only. Part Number: 15398. Notes: Downpipe. MagnaFlow's stainless steel Tru-X crossover pipe represents a significant leap forward in technology over traditional H-pipes. The more gentle radius allows for better exhaust gas scavenging, noise cancellation and better balance between cylinder banks. 1999-2007 Ford F-250 / F-350 Super Duty 7.3L & 6.0L V8 Powerstroke. Exhaust Type: Single. The Aluminized PRO Series has a limited 1 year warranty with an aluminized muffler and no tip. Quantity: Sold as a kit. 1996-2001 Honda Prelude 2.2L. MagnaFlow direct-fit catalytic converters are designed for easy bolt-on installation for the professional installer. These cats feature a ribbed body that minimizes expansion and distortion when the converters heat up. 2007-2010 BMW 335i 3.0L L6. 2009-2010 BMW 335i xDrive 3.0L L6. Our exhaust systems feature straight-through flow designs for the ultimate in unrestricted horsepower and torque for big power while maintaining exhaust efficiency. Geo Prizm 1997 L41.8LGAS. Geo Prizm 1997 L41.6LGAS. Geo Prizm 1996 L41.8LGAS. Geo Prizm 1996 L41.6LGAS. Geo Prizm 1995 L41.8LGAS. Geo Prizm 1995 L41.6LGAS. Geo Prizm 1994 L41.8LGAS. Geo Prizm 1994 L41.6LGAS. Manufacturer's Part Number 23696. Miata 1997 L41.8LGAS. Miata 1996 L41.8LGAS. Miata 1995 L41.8LGAS. Miata 1994 L41.8LGAS. MagnaFlow direct-fit catalytic converters are designed for easy bolt-on installation for the professional installer. 2005-2012 Toyota Tacoma 4.0L V6. Exhaust Type: Single. Muffler Quantity: One. Quantity: Sold as a kit. Tip Finish: Satin. Tip Material: Stainless steel. Tip Edge Style: Non-rolled edge. Tip Cut: Turndown slant. 2015-2016 Hyundai Genesis 5.0L V8. Our exhaust systems feature straight-through flow designs for the ultimate in unrestricted horsepower and torque for big power while maintaining exhaust efficiency. This MagnaFlow universal spun catalytic converters utilize the revolutionary new catalyst technology. The MagnaFlow universal spun catalytic converters are literally manufactured around the catalyst, which is securely tucked inside and necks down to thicker-gauge material at the inlet/oulet for maximum durability. 2011-2016 Ford F-250 / F-350 Super Duty 6.7L V8 Powerstroke. Exhaust Type: Single. Tip Quantity: Dual. System Finish: Black ceramic coated/Natural. Tip Finish: Black ceramic coated. System Style: Particulate filter back. Converter Substrate Material: Ceramic honeycomb. Notes: Round body converter. Converter Case Material: Stainless steel. Converter Overall Length (in): 13.000 in. Converter Overall Thickness (in): 4.000 in. 2007-2010 BMW 335I 3.0L L6 Coupe. Notes: Touring series exhaust system. Fits coupe models only. Our exhaust systems feature straight-through flow designs for the ultimate in unrestricted horsepower and torque for big power while maintaining exhaust efficiency. 2011-2017 Buick Regal 2.0L L4 (Excluding GS Models). Our exhaust systems feature straight-through flow designs for the ultimate in unrestricted horsepower and torque for big power while maintaining exhaust efficiency. 2015-2018 BMW M4 3.0L L6. Our exhaust systems feature straight-through flow designs for the ultimate in unrestricted horsepower and torque for big power while maintaining exhaust efficiency. These systems are an engineered balance of interior and exterior noise levels and are tested against SAE j1169 standards. 2006-2013 Lexus IS250 / IS350 2.5L V6 (Excluding Convertible). Our exhaust systems feature straight-through flow designs for the ultimate in unrestricted horsepower and torque for big power while maintaining exhaust efficiency. 2011 BMW 335I XDrive 3.0L L6Sedan. 2011-2012 BMW 335I 3.0L L6. Our exhaust systems feature straight-through flow designs for the ultimate in unrestricted horsepower and torque for big power while maintaining exhaust efficiency. 2013-2016 Dodge Dart 1.4L 2.4L L4. Our exhaust systems feature straight-through flow designs for the ultimate in unrestricted horsepower and torque for big power while maintaining exhaust efficiency. 2006-2009 Pontiac Solstice 2.4L L4. Our exhaust systems feature straight-through flow designs for the ultimate in unrestricted horsepower and torque for big power while maintaining exhaust efficiency. 2014-2018 Mazda 6 2.5L L4. Our exhaust systems feature straight-through flow designs for the ultimate in unrestricted horsepower and torque for big power while maintaining exhaust efficiency. These systems are an engineered balance of interior and exterior noise levels and are tested against SAE j1169 standards. 2010-2013 Mazda 3 2.0L L4 Sedan. Our exhaust systems feature straight-through flow designs for the ultimate in unrestricted horsepower and torque for big power while maintaining exhaust efficiency. These systems are an engineered balance of interior and exterior noise levels and are tested against SAE j1169 standards. 2004-2008 Chrysler Crossfire 3.2L V6. Our exhaust systems feature straight-through flow designs for the ultimate in unrestricted horsepower and torque for big power while maintaining exhaust efficiency. 2002-2003 Mitsubishi Lancer ES & OZ Models 2.0L L4. Our exhaust systems feature straight-through flow designs for the ultimate in unrestricted horsepower and torque for big power while maintaining exhaust efficiency. 2014-2017 Mazda 3 2.0L 2.5L L4 Hatchback. Our exhaust systems feature straight-through flow designs for the ultimate in unrestricted horsepower and torque for big power while maintaining exhaust efficiency. 2014-2017 Ford Fusion 1.5L L4. Our exhaust systems feature straight-through flow designs for the ultimate in unrestricted horsepower and torque for big power while maintaining exhaust efficiency. These systems are an engineered balance of interior and exterior noise levels and are tested against SAE j1169 standards. 2002-2003 Mazda Protege5 2.0L L4. Our exhaust systems feature straight-through flow designs for the ultimate in unrestricted horsepower and torque for big power while maintaining exhaust efficiency. These systems are an engineered balance of interior and exterior noise levels and are tested against SAE j1169 standards. 2010-2014 Audi A5 Quattro 2.0L. Our exhaust systems feature straight-through flow designs for the ultimate in unrestricted horsepower and torque for big power while maintaining exhaust efficiency. These systems are an engineered balance of interior and exterior noise levels and are tested against SAE j1169 standards. 2008-2012 Chevrolet Malibu 2.4L L4. Our exhaust systems feature straight-through flow designs for the ultimate in unrestricted horsepower and torque for big power while maintaining exhaust efficiency. 2006-2007 Chevrolet Monte Carlo SS 5.3L V8. Our exhaust systems feature straight-through flow designs for the ultimate in unrestricted horsepower and torque for big power while maintaining exhaust efficiency. 2014-2017 Mazda 3 2.0L L4 Sedan. Our exhaust systems feature straight-through flow designs for the ultimate in unrestricted horsepower and torque for big power while maintaining exhaust efficiency. These systems are an engineered balance of interior and exterior noise levels and are tested against SAE j1169 standards. 2015-2016 Audi A3 1.8L L4. Our exhaust systems feature straight-through flow designs for the ultimate in unrestricted horsepower and torque for big power while maintaining exhaust efficiency. These systems are an engineered balance of interior and exterior noise levels and are tested against SAE j1169 standards. 2011-2014 Mazda 2 1.5L L4. Our exhaust systems feature straight-through flow designs for the ultimate in unrestricted horsepower and torque for big power while maintaining exhaust efficiency. These systems are an engineered balance of interior and exterior noise levels and are tested against SAE j1169 standards. 2006-2009 Volkswagen Rabbit 2.5L L5 2010-2014 Volkswagen Golf 2.5L L5. Our exhaust systems feature straight-through flow designs for the ultimate in unrestricted horsepower and torque for big power while maintaining exhaust efficiency. 2015-2018 Mazda MX-5 Miata 2.0L L4. Our exhaust systems feature straight-through flow designs for the ultimate in unrestricted horsepower and torque for big power while maintaining exhaust efficiency.